L aparoscopic small bowel procedures resection and lysis of adhesion for small bowel obstruction and chronic abdominal pain are the common laparscopic procedures for problems related to the small bowel procedure. Indications for laparoscopic resection of the small bowel procedure are the same as those for open procedures and include benign and malignant neoplasms, strictures or inflamed areas from radiation or inflammatory bowel disease, Meckel’s diverticulum, and bleeding arteriovenous malformations. Operations can be performed by constructing the anastomosis inside the peritoneal cavity (intracorporeal anastomosis) or by bringing the loops to the outside through a small incision (extracorporeal anastomosis) . Laparoscopic surgery lysis of adhesions is commonly used to resolve small bowel obstruction and occasionally to relieve abdominal pain syndromes. The etiology of adhesions is usually related to prior abdominal surgery, although congenital bands and adhesions from intraabdominal or pelvic inflammatory processes may be responsible. 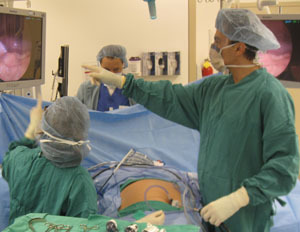 At operation, the small bowel is grasped with atraumatic laparoscopic clamps and “run” until the point of obstruction is encountered. The causative adhesions are then divided . It may be useful to divide any other obvious bands. The results with this technique have been favorable both for resolution of obstructive symptoms and in providing symptomatic relief in patients with chronic abdominal pain syndromes. More recently, minimally invasive small bowel surgery can be performed using robotic technology. The da Vinci System is a robotic surgical platform designed to enable complex procedures of all types to be performed. There have been some major benefits experienced by surgeons using the da Vinci Robotic Surgical System over traditional laparoscopic approaches. These benefits are greater surgical precision, increased range of motion, improved dexterity, enhanced visualization and improved access. 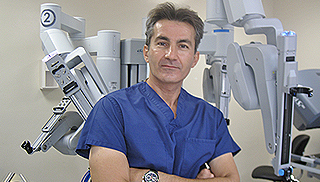 At NEWPORT LAPAROSCOPY, Dr. Iraniha robotic expert performs robotic small bowel surgical procedures. After a thorough evaluation, Dr. Iraniha will determine whether robotic small bowel surgery is appropriate for a particular patient’s situation.